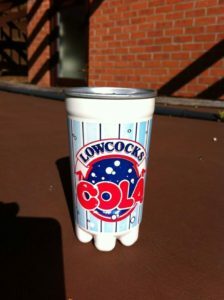 Lowcock's Lemonade - Misc. Lowcock's Lemonade - Misc. Thanks for visiting the Lowcock’s Lemonade Misc. memorabilia page. I am NOT affiliated with Lowcock’s Lemonade in any past, present or future capacity. I just share the same name. If you’re interested in the Lowcock surname you can read up Lowcock Genealogy and about me here. This Lowcock’s Lemonade Miscellaneous page includes items that I can’t identify, sit in no clear category, or where I need help. 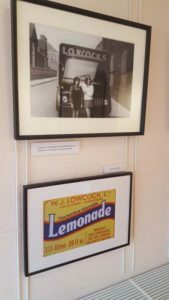 LoveMiddlesbrough has a blog which has a photo from the Dorman Museum, which has a photo of a Lowcock Truck and sign. I can’t read the text. If anyone happens to ever be nearby the museum, I’d love a better photo and details of the caption so I can properly classify these items. The photo archive wouldn’t be complete without proof that Lowcock’s Lemonade had fans. Below is a badge (again, from a long gone eBay listing). The following picture is a bit more random. BeSpoke Tyre and Autocare in the UK took over the Lowcock’s Lemonade factory (probably the re-launch factory, as their address is Derwent St, Middlesbrough) and shared the following “treasure” on Facebook, not sure what it is, a cup/mug/cooler of some sort that is branded Lowcock’s Cola.